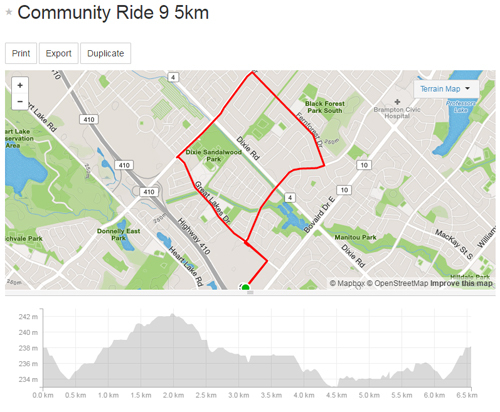 Register for BCAC’s FREE community ride, your choice of 5km or 15km route, depending on your comfort level. All cyclists are welcome, whether you live in Brampton or are visiting. Come and learn about cycling in Brampton! You are encouraged to preregister online to make our start go smoothly and quickly. However, we can accommodate you if you make a last-minute decision to join us. Featuring west side of Springdale community. There will be a short safety talk before our ride starts. Get your postcard stamped by the Ride Leader! 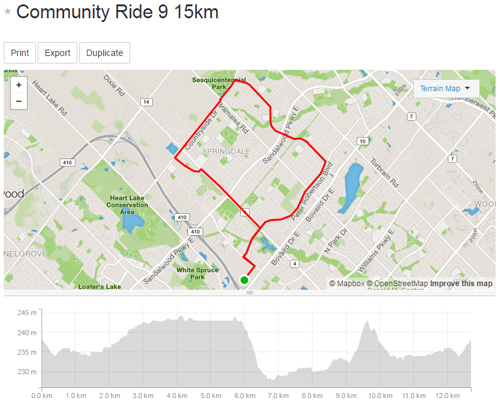 Count on the 5km route taking 45 minutes and the 15km ride taking 1 ½ hours. Route lengths and times to complete, are of course, approximate. if you have to leave the route, please notify the Ride Sweep, who will be trying to keep count of our riders! We return to Marble Slab Creamery at the same place. A refreshment will be served compliments of City of Brampton. Come on out to meet your neighbours and visitors to Brampton! See below for more information about children & youth riders! A friendly reminder that riders agree to ride at their own risk and are requested to sign the Brampton Community Ride Waiver Form before participating. Helmet use with fastened chin strap is strongly encouraged, and is mandatory for those under 18. Parents have a duty to ensure helmet use for children under 16. Riders are photographed for promotional purposes. Riders are encouraged to register on the Eventbrite link provided to ensure we have a refreshment waiting for you at the end of the ride. Routes are carefully planned and may be subject to change should situations arise. Do pay attention to the Ride Leader and Sweep, and have fun! Check out our calendar for other rides this season. Brampton Cycling Advisory Committee is hosting 10 rides between May 15th and August 7th.